Eucommia bark (Duzhong)-Eucommia ulmoides oliv. Botanical Name: Eucommia ulmoides oliv. Part Used & Method for Pharmaceutical Preparations: The bark is gathered in summer and autumn. The rough bark is removed and discarded, and then the smooth bark is dried in the sun. 1. Deficiency of liver and kidneys manifested as soreness and pain in the lower back and knees. Eucommia bark (Duzhong) is used with Psoralea fruit (Buguzhi) and Walnut seed (Hutaoren). 2. Impotence due to deficient kidneys. 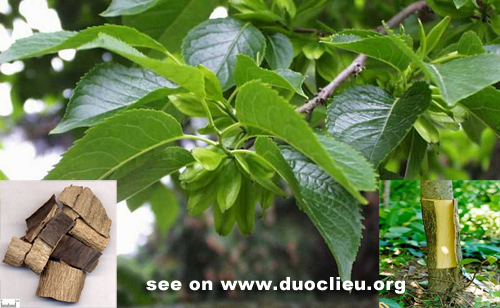 Eucommia bark (Duzhong) is used with Dogwood fruit (Shanzhuyu), Dadder seed (Tusizi) and Schisandra fruit (Wuweizi). 3. Threatened abortion or restlessness of fetus manifested as lower abdominal pain and uterine bleeding. Eucommia bark (Duzhong) is used with Teasel root (Xuduan) and Dioscorea (Shanyao). Cautions & Contraindications: The fried herb is more effective than the raw herb. Eucommia bark (Duzhong) is contraindicated in cases with deficiency of yin with excessive fire.